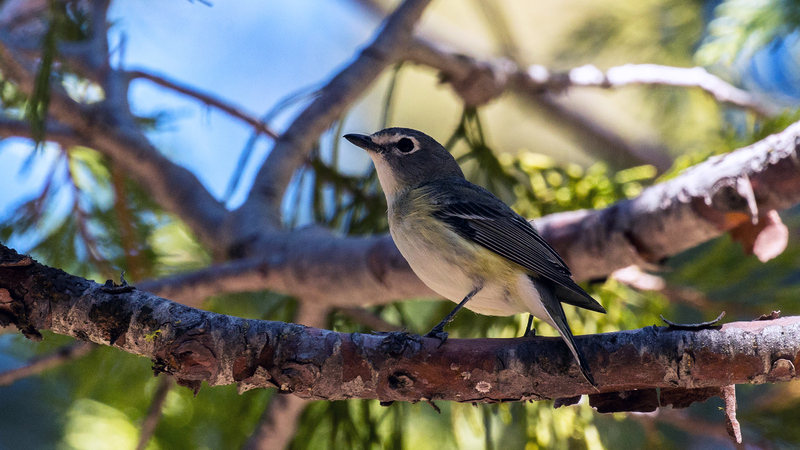 The chase began, as they usually do, with a rare bird email report from ebird on 3/14 by Emilie Strauss about a sighting of a pair of Cassin’s Kingbirds. 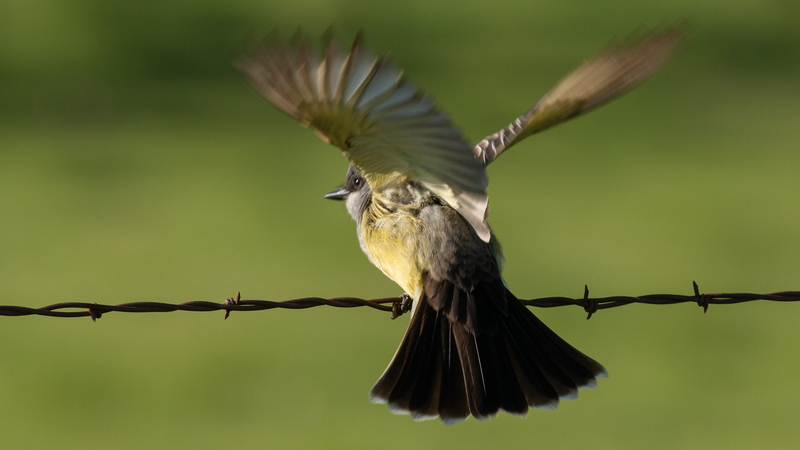 Cassin’s Kingbirds are rare to uncommon in the county with a pretty limited distribution, mostly along the creeks that feed down from the east side of the Coast Range. In addition to being somewhat rare in the valley, they are also very similar in appearance to the much more common Western Kingbirds. As it turns out, Cassin’s Kingbird also happens to be a species that I clearly needed better photos of, so it became my target bird for this morning’s adventure. 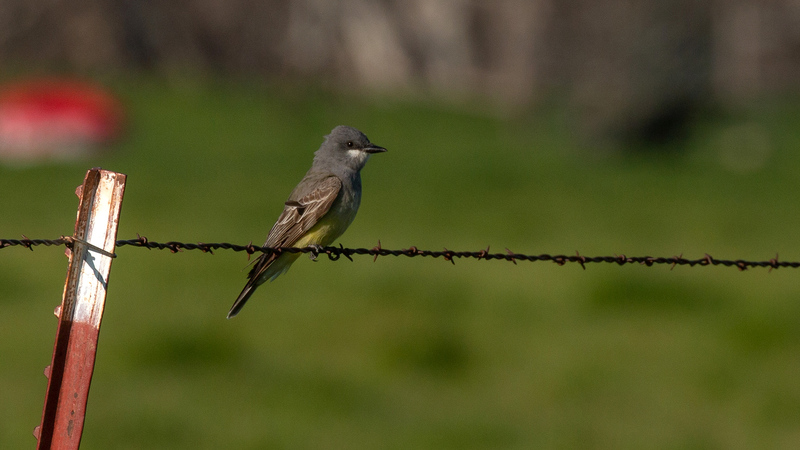 Going back to when I first started birding the Central Valley over 30 years ago, Cassin’s Kingbirds were only known to be found at a handful of locations between Fresno and San Joaquin Counties with most observations coming from Panoche Valley and the Tracy Golf Course. My first sighing in Stanislaus County was along the lower entrance of Del Puerto Canyon and my dismal photograph barely shows the identifying field marks. In recent years, in Stanislaus County, they have been seen at more locations and a little more frequently with multiple sightings along Orestimba Rd between Interstate 5 and the Orestimba Creek Bridge. It was in this general area that Emilie reported finding them 3-days prior and it was where I told my car’s GPS that I needed to go. 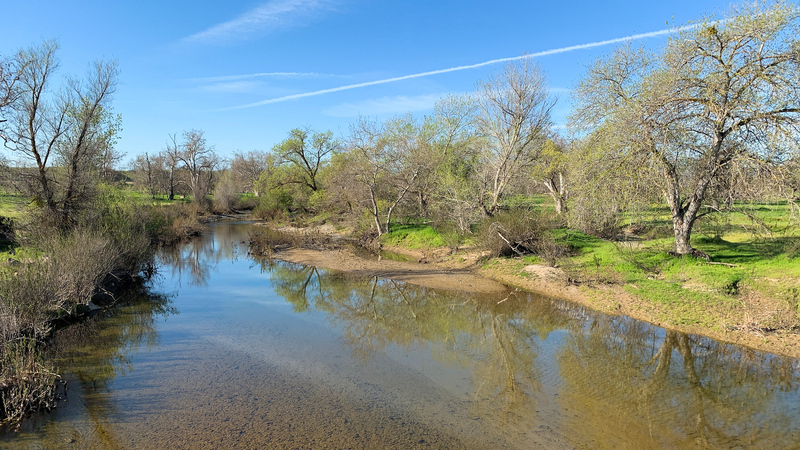 I have visited the Orestimba Creek area before and it is a beautiful riparian setting with one of the largest groves of California Sycamore I know of. The drive over there, on a spectacularly pleasant Spring Morning, had me enthralled with the green scenery and lulled into a peaceful state-of-mind as I listened to some Enya song and I enjoyed a slow drive with my windows down. I wasn’t quite to the spot I expected to find the target birds, but suddenly, my ears yelled to my brain “PAY ATTENTION, THEY’RE CALLING RIGHT NEXT TO YOU”! 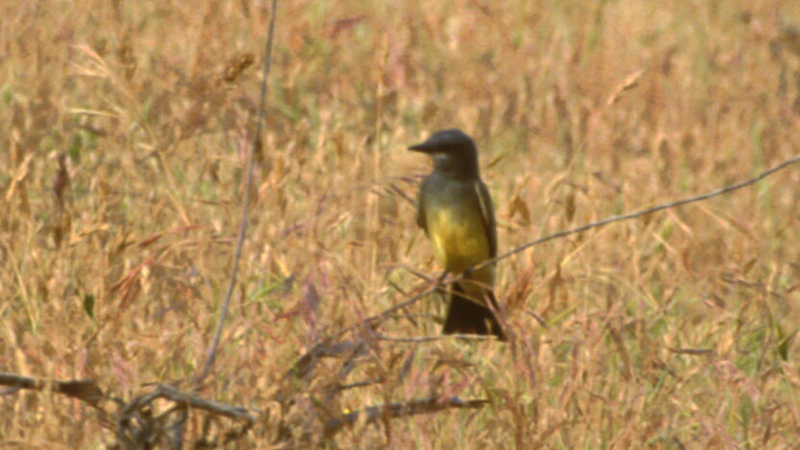 As I stopped quite suddenly, in the middle of the road, I could hear, not one, not two, but 4 Cassin’s Kingbirds earnestly calling back and forth, giving their rapid CHI-Vrrrr, CHI-Vrrrr, CHI-Vrrrr calls. In fact, there was one on the fence line about 40 yards away, behind me! Yes, I had driven right past it in LaLa land. I knew that given the light conditions, I was going to have to make a U-turn, go well past the birds, and then make another U-turn to get back facing the right direction. As I had mentioned before, Western Kingbirds, the most expected kingbird for our area, is very similar, at a glance to the Cassin’s Kingbird, both in appearance and in behavior. 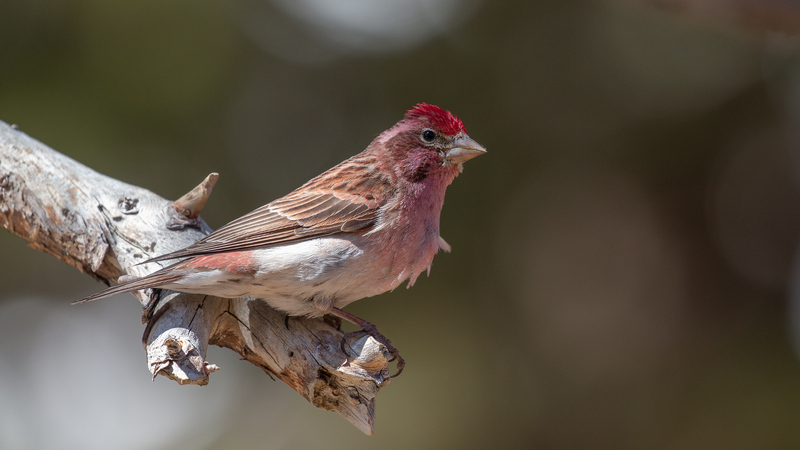 They both are frequently seen sitting on barbed wire fence lines or electrical/phone lines where they sally forth to snag passing moths and other flying insects. 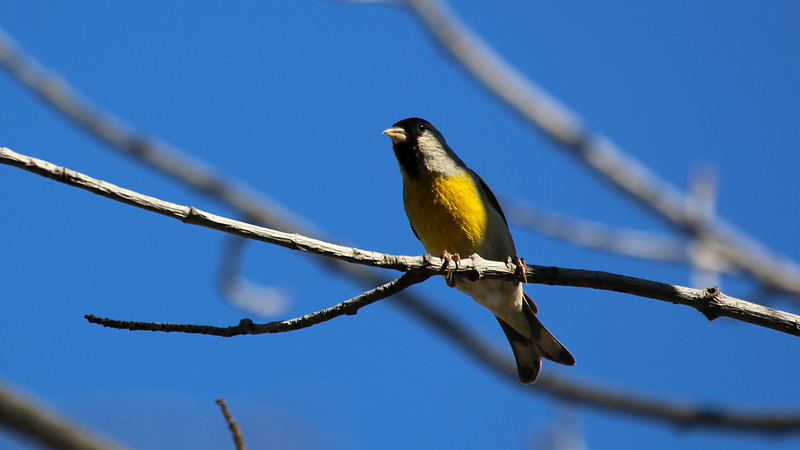 They both sport a sunny yellow belly with grayish heads and backs and longish dark tails. But, as they say, the devil’s in the details. 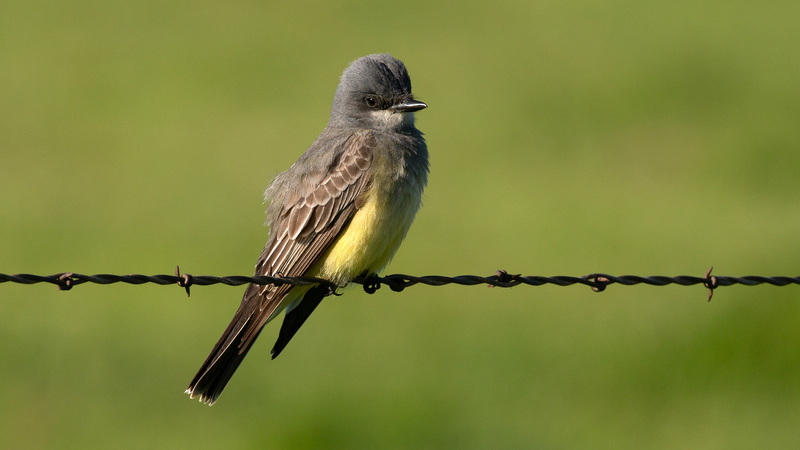 The gray on the Cassin’s Kingbird is darker, with a clearly visible white chin. Upon further inspection, the tails offer a different combination of buffy edging. 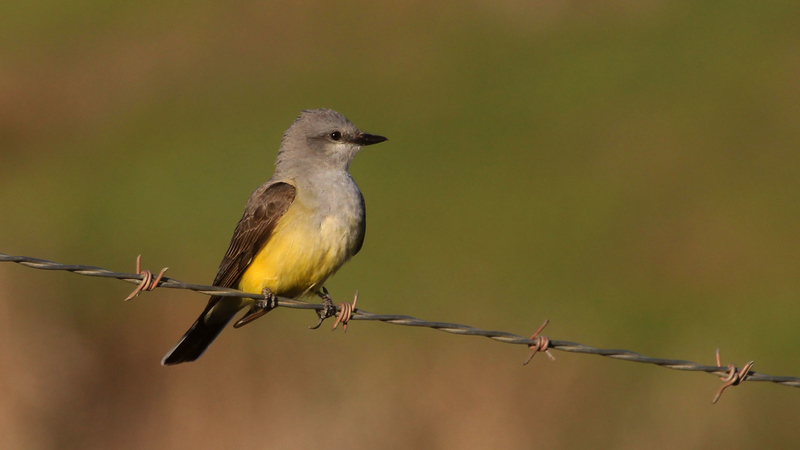 While the Western Kingbird has a bold edge along the sides of the tail, the Cassin’s has the buffy coloration at the tips of the tail feathers. Oh, and as my ears pointed out to my brain, the Cassin’s offers a chi-vrrrr, chi-vrrrr, chi-vrrrr rapid call which is quite distinctive and different from the squeaky pidik pik pidik PEEKado call of the Western. As I was photographing the kingbirds, a pickup drove up to me and asked what was special about the bird I was photographing. I casually mentioned the kingbirds and how they were similar and different at the same time (avoiding the “Rare” term), and he asked why the one was called “Cassin’s.” And I thought, “What a great question”! I got to thinking about the other “Cassin’s” birds I could think of… Cassin’s Finch, Cassin’s Vireo, Cassin’s Auklet and Cassin’s Sparrow. I found an excellent article posted on the California Audubon’s Audublog called, “John Cassin: America’s First Taxonomist.” It is actually a reposting of an article from the Mount Diablo Audubon Society’s newsletter, The Quail. It gives a fascinating account of all the species that bear his name and how he became established as America’s First Taxonomist in the mid-1800s. In short, he was made the honorary curator of the Philadelphia Academy of Natural Sciences where he “discovered” nearly 200 species from the Academy’s collection of specimens.